Emi & Katsu’s Hatsume Top 5! Katsu and I love to stroll through Roji-en on a festival day! The gardens are buzzing with excitement, especially when Roji-en is in full spring bloom. Enjoy an open-air tea ceremony or picnic under hand-crafted cherry blossoms. Oh, and make sure to pick up a Morikami picnic blanket! Once you’ve purchased your piping hot Spring Rolls, you’ll want a nice chilled beverage to go with them. Visit the Kirin Beer Garden or the ever-popular Sake Station – staffed by Stacole Fine Wines, and a very special guest directly from Japan: Richard Priest of the Kikusui Brewery! Richard will pour some delicious selections from his brewery AND squeeze in some Sake 101 talks. Once we’ve had our fill of delicious food and drinks, Katsu and I like to meander through the avenues of craft, plant and tea vendors. There are so many wonderful vendors to see that we need both days to scout out what we want to purchase (That’s why we’re so excited about the new weekend pass!) Whether you like handmade jewelry, bonsai trees, authentic Japanese teas, or locally designed apparel, there’s something for everyone in the Hatsume Marketplace. After we’ve closed the deal on some fantastic finds, Katsu can’t wait to head to the kids’ activities. This year he’s especially excited about making onigiri, or Japanese rice balls, with the education staff. Katsu is also looking forward to playing with ribbon kites and making his own origami planter with matching origami butterfly! Anime has been one of mine and Katsu’s favorite parts of Hatsume since it was added in 2009. We can’t wait to see all the exciting things Tate’s and the other anime vendors will bring! Katsu loves to watch the Fine Print Shoppe live screen print t-shirts, and this year yours truly are featured on the shirts (designed by local artist TeslaCake)! You can get your Emi or Katsu shirt printed for FREE when you bring your own shirt, or buy one for $10. As if the anime vendors weren’t enough to keep you busy all day, this year – for the first time ever- there will be a Hatsume Arcade featuring classic Japanese video games like Pacman, Dance Dance Revolution, and Galanga. When you’ve danced your heart out in the theater, head over to the Morikami Caricature station in the lobby, and take home your very own hand-drawn caricature to commemorate your day at Hatsume. Last but certainly not least, bee-line to the Pikachu stage on Saturday for the Costume Contest, and on Sunday for the 2nd Annual Fashion Show (just one more reason we think you should try out a weekend pass). The colorful and creative outfits are sure to wow in the last few hours of the festival, and the competition is fierce! That brings us to the number one thing we love about Hatsume Fair – the entertainment! We’ll hear Richard Priest of Kikusui Brewery give us the sake lowdown on the Pikachu Stage, before it transforms into a runway for the hottest costume and fashion contests this side of Palm Beach. Come strut your stuff or play paparazzi! Over at the Osaka Stage you’ll witness the stamina and dedication of the very best of local martial artists. Hatsume is the only time of year you can see all these athletes in one place, so don’t miss out! And, finally, on the Tokyo Stage: take in the rumbling of the taiko drums! You might have guessed that this is Katsu’s favorite part of the day, and he can’t wait to take part in the interactive kids’ taiko show at noon on both days. The Tokyo stage plays host to Ronin Taiko & the Wadaiko Academy on Saturday, and Fushu Daiko on Sunday. So, if you want to pick your favorite, you’ll have to get that weekend pass! Thanks to Emi & Katsu for helping us pick out the best parts of Hatsume, and please feel free to add to the list in the comments below – we love hearing from you! See you all in a couple of weeks! The Morikami Museum’s annual spring festival “Hatsume” has become well known in Florida. This year the two day celebration will be March 19th and 20th. There is no Hatsume festival in Japan; however, if you know the meaning of the word, you would certainly appreciate and understand the naming of this celebration. Some readers who studied Japanese will figure out that “Hatsume” is the spring festival. The character of “hatsu” means the first or new, and “me” means a bud. Certainly, Floridians are enjoying soft warm spring weather. Gorgeous Japanese cherry blossoms are a sign of spring in Washington D.C. The National Cherry Blossom Festival will be March 26-April 10 this year. 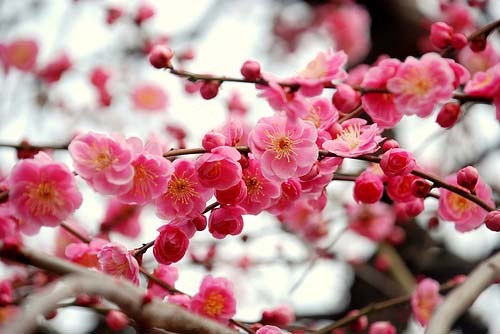 Cherry blossoms in Japan, sakura, are beautiful in April, but there is an equally beautiful blossom enjoyed by Japanese and visiting foreigners at the end of February and early March before sakura bloom. These blossoms (pictured below) are a sign of spring in Japan. Guess the name of this tree! Can you guess the name of this tree pictured? *Japanese call the blossom “harutsugegusa.” These three Japanese characters are spring, tell and plant, which translates as “sign of spring.” However, this is not a commonly known name. *The plant is known by a number of different names in English. One of them is Japanese apricot. *The tree originated in South China. If you find out the name of tree, send your answer quick. 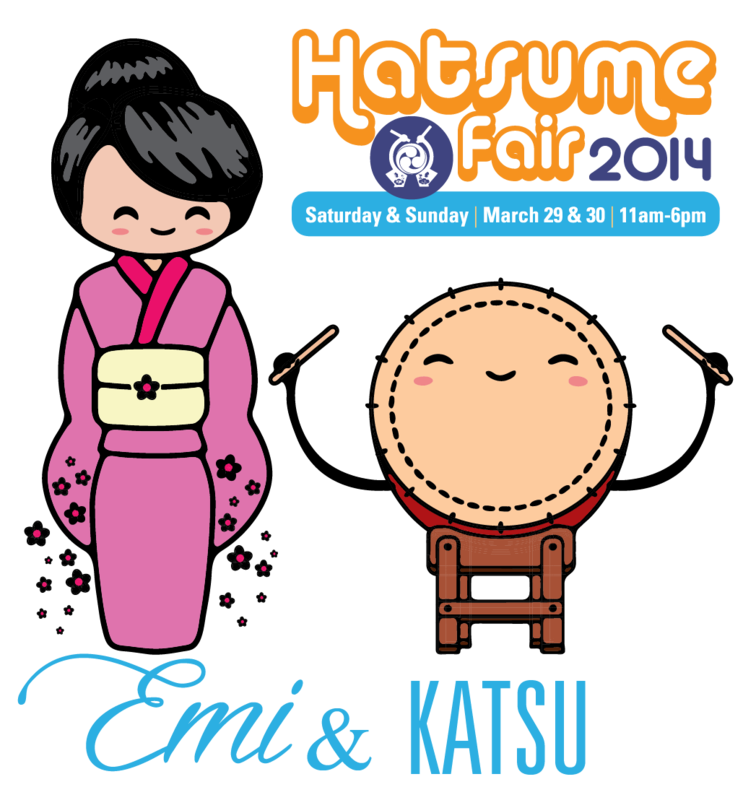 The first to respond will receive a pair of tickets to Hatsume Fair!